Benjamin Britten’s “The Young Person’s Guide to the Orchestra” will be the featured work in a Family Concert to be presented in the Waikanae Memorial Hall on Saturday, 8 August at 2.30pm by the Kapiti Concert Orchestra and conductor Christiaan van der Zee. The KCO will be joined by members of the Kapiti Youth Orchestra for this work which Benjamin Britten originally wrote as a score for an educational film in 1946. It has since become a popular concert piece which will appeal to children and adults alike as an entertaining narrated introduction to the instruments of the modern orchestra. Sharon Crosbie, a former Radio New Zealand broadcaster, will make a guest appearance as the Narrator. Guest soloist, Anna van der Zee, will play Franz Schubert’s Rondo for Solo Violin and String Orchestra. Anna currently plays with the New Zealand Symphony Orchestra but has previously spent time studying and performing overseas. Along with her husband, Christiaan, Anna was a founding member of the Tasman Quartet who left New Zealand to study in Colorado with the Takacs Quartet and later played in numerous international music festivals before returning to tour New Zealand for Chamber Music New Zealand. The concert will conclude with Beethoven’s 6th Symphony, “the Pastorale”, which represents an expression of the composer’s love for nature. Each movement is given a descriptive note such as “Merry Gathering of Countryfolk”, “Thunder, Storm” , “Shepherd’s Song”… It is a wonderful evocation of life in the countryside through music. 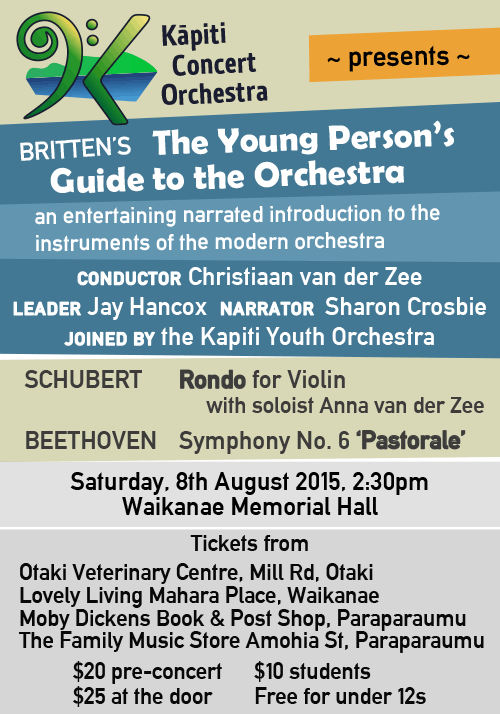 Tickets for this concert will be available from Otaki Veterinary Centre, Otaki.